Industrial Steel Safety-Security Folding Gates. Industrial gates provide temporary barriers to keep areas free from traffic and safe for workers to perform tasks. Folding gates may be used indoors and outdoors as either stand alone units or units connected in a series to form longer barriers. Steel gates can be placed around sensitive areas at night to aid in security and taken up the next morning. Other models can be used indoors by cleaning crews who need to keep wet floors off limits to pedestrian and vehicle traffic. Safety gates are also excellent tools for construction crews who need to cordon off piles of debris that occasionally accumulate during the course of the day. Easy Rack supplies both used and new industrial gates, folding gates, safety gates, and steel gates in a wide range of sizes for factories and warehouses. Easy Rack specialists will consult with you over the phone and help you choose the right security gates and industrial gates for your facility at no charge for their time. We will also coordinate drop shipping of any new or used industrial gates anywhere in the United States. The following are just a few of the steel and folding gates we make available to warehouses, factories, and construction crews. Industrial & Commercial Folding - Expandable Scissor Gates. The expand-a-gate expands from a collapsed width of 14.5" to 144" maximum. It is an ideal stand-alone barrier that is designed to temporarily prohibit access to areas for cleaning or safety concerns. Multiple folding gates may be connected end-to-end to form longer runs. This is especially useful to construction operations that may need to section off half of an entire new floor. The Expand-A-Gate features heavy-duty construction with painted yellow & black finish and is available in all steel or all aluminium construction. All Galvanized Folding Gates & Portable Gate. These 15-gauge steel folding gates are manufactured for fast installation. You can use them to secure outside access during the day and add security at night with heavy-duty Durable 3" rubber casters allow the operator to quickly and fully retract gate when not in use. The center drop pin rests in a pre-drilled hole to secure the steel gate when extended. A lock is located on the right side of single gates. Each gate is constructed of steel U-channels riveted back-to-back using aircraft quality rivets and heavy-duty 1½" x 1½" vertical angles. It is then galvanized for durability. *Easy Rack includes all necessary installation hardware with your order. Contact Easy Rack directly for a full range of sizes. Portable gates are perfect for many applications. Workers can use them to block equipment, personnel and entrances. They are also useful barriers to use for security both inside and outside of buildings. Portable gates expand and lock to close off any opening. When they are not in use, simply fold them up, roll away and store. Easy Rack supplies an optional add-on section to create larger runs. Folding security gates block access to passageways and buildings without blocking ventilation or limiting visibility. Warehouses and manufacturers use folding gates to protect halls, entrances to buildings, warehouse doors, docks, and plant entrances. Security gates improve security, prevent unauthorized access to restricted areas, maintain ventilation to the building, and provide guards and managers with visibility in both directions. Collapsible gates install over dock doors, lift-up doors, hallways and entranceways and provide ventilation, visibility, and security. Collapsible gates are manufactured from 3/4" wide 14 gauge steel channel that is riveted together back to back. Portable security gates are often used for restricting access in hospitals, schools and construction sites where certain areas must be protected from theft or vandalism, or where certain areas simply do not need to be accessed by the general public. teel security gates block access points and create restricted areas for security and safety reasons. Made from a sturdy, impenetrable lattice of 14-guage channel steel, a steel security gate cannot be pushed through or broken down. Metal security gates block access points and create restricted areas for security and safety reasons. Made from a sturdy, impenetrable lattice of 14-guage channel steel, a metal security gate cannot be pushed through or broken down. Industrial security gates are intended to cover access points of different types and sizes. They are made from a sturdy, impenetrable lattice work of 14-guage channel steel. Warehouses and manufacturers commonly use folding security gates to protect halls, building entrances, bay doors, docks, and rear entrances to plants. 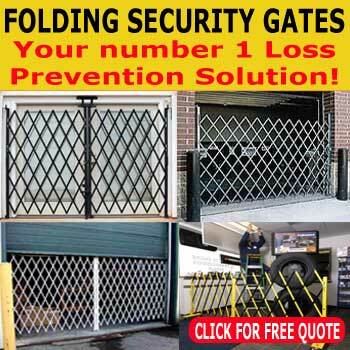 Warehouse folding door security gates. Even the sturdiest of doors do not always prevent unauthorized entry or break in. Intruders can and will enter virtually any door if they enough determination.